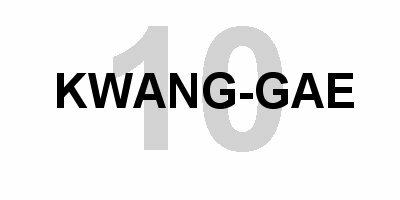 The 10th pattern in Tae Kwon Do is Kwang-Gae. Kwang-Gae is the hyung (pattern) required for advancement from 1st Gup Red Belt with Black Stripe to 1st Degree Black Belt in the International TaeKwon-Do Association. You "Yell" (YAH) only on the last movement of Kwang-Gae. Student: Kwang-Gae of TaeKwon-Do Hyung. Student: The 19th King of the Korguryo Dynasty. He recovered all the lost territories including the greater part of Manchuria. The foot diagram represents the expansion and recovery of the lost territory. the Book or DVD of this pattern.